Slowly but surely the petals are falling from my tulips, one by one, leaving skinny seed pods where yesterday hovered fat balloons of shot silk. The first to fade were ‘Christmas Orange’ and ‘Portland’, followed by ‘Brown Sugar’ and ‘Dom Pedro’. In general I don’t enjoy looking at flowers when they go over, but tulips I can watch until the very last petal drops. Then they go unceremoniously in the bin. Many of my bulbs were planted in January and a few, as an experiment, as late as March. The last to be planted are still in bud but appear as if they will bloom as prolifically as the rest. I also have one remaining pot of Hyacinth ‘Gypsy Queen’ to enjoy. 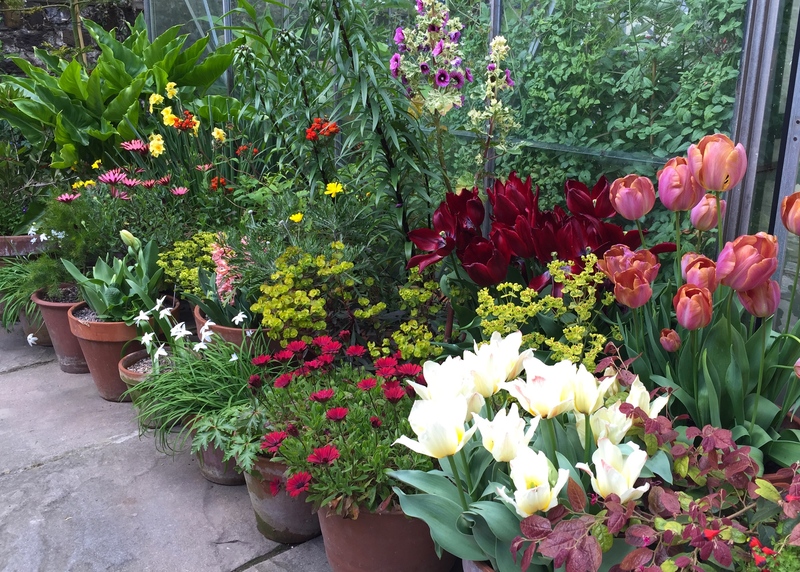 They, and the tulips, may well last into June. The ‘new’ garden at the back of the house is still at the mercy of tradesmen, albeit considerate ones, and therefore remains in a temporary arrangement. The side extension of the house is finally due to be rendered this week, after which it will be decorated and handed back to me. It’s been 12 months since work began, and I am feeling it. I know from experience that plaster and plants do not mix, so am keeping the two as far apart as humanly possible in a space measuring only 400 square feet. 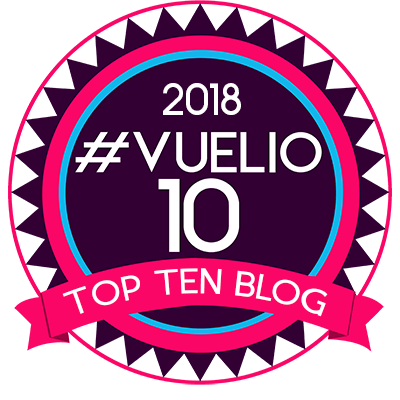 I have a plan for the ‘new’ garden – a plan I am particularly excited about – but it requires more time and money to realise than I have at my disposal. In the short-term the greenhouse will remain and I’ll use the outside space for growing on and getting to know unfamiliar plants. I would like this space to have a more open, Mediterranean feel than the ‘old’ garden. I realised over winter that the ‘new’ garden receives much less sun from October to March. Whilst sheltered from easterly winds, there are some destructive eddies which can send pots tumbling, especially if they are dry. In summer, even though the garden is west-facing, the sun is gone by 6pm. This is why owners of new gardens are advised to live with their plot for a year before making any major alterations. I have waited two, so feel more than ready to crack on. The most flattering angle I can manage at the moment! When the decorator has departed I will move those plants I do have – all in pots – to positions next to the house. The water tap is poorly situated next to the French windows, so I am unable to have mirroring arrangements either side of the doors. Having just returned from a business trip to Tuscany I have, naturally, been compelled to buy an olive tree. I will not be the first Englishman to be tempted into recreating a piece of Italy on this damp island of ours; I just hope the results are not too embarrassing. The olive tree came from the local garden centre, complete with a miniature bottle of extra virgin oil dangling from its crown. Unnecessary, and misleading since there’s absolutely no possibility of producing olive oil, however balmy the climate in Thanet. I’ve planted my tree in a large pot with Tuscan leanings so that it can be moved into shelter over winter. One day the olive will form part of my master plan. Meanwhile there is plenty of colour to be found amongst the waifs and strays that haven’t quite found a permanent home in the garden. Tulip ‘Lasting Love’ has been flowering for so long that I can’t recall when it first began. 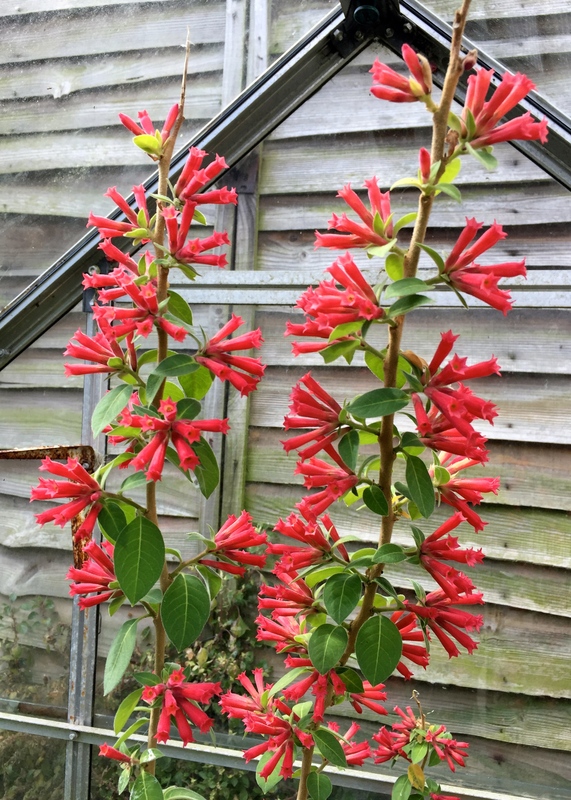 The dark red flowers have not lost an ounce of pigment since they emerged. ‘Lasting Love’ is now joined by ‘Albion Star’ and ‘Malaika’ to form a quirky, rather autumnal association with euphorbias and Loropetalum ‘Ming Dynasty’. 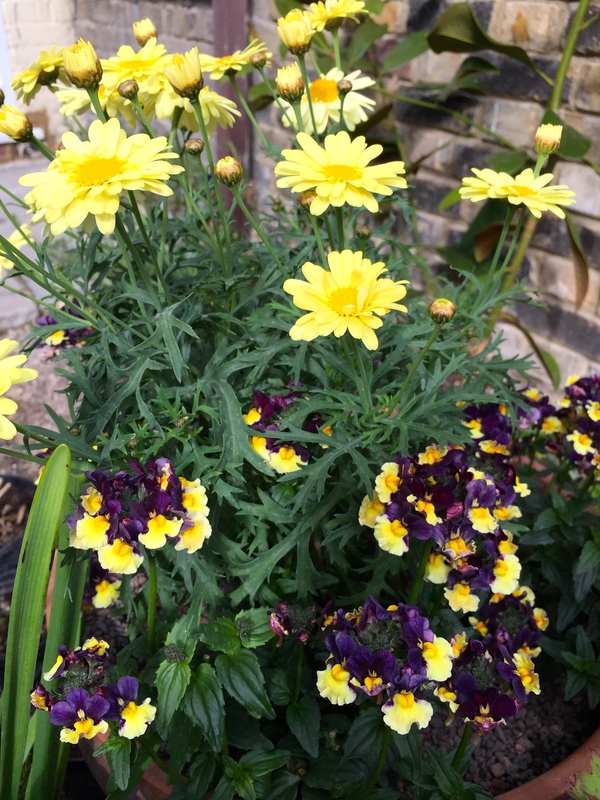 No attempt has been made in this part of the garden to create subtle plant harmonies, but, come summer, I am going for yellows and purples, beginning with two large pots of yellow marguerite (Argyranthemum frutescens ‘Madeira Crested Yellow’) surrounded by Nemesia ‘Plums and Custard’. This extraordinarily bicoloured nemesia has the same delicious scent as ‘Wisley Vanilla’ and will have summer visitors sticking their nose in various corners trying to deduce where the perfume is coming from. No hint of plums though, it’s all custard. Ipheion grow prolifically in Broadstairs, as do agapanthus and nerines. They are part of a club that enjoy the relatively dry, sunny climate in this part of England. 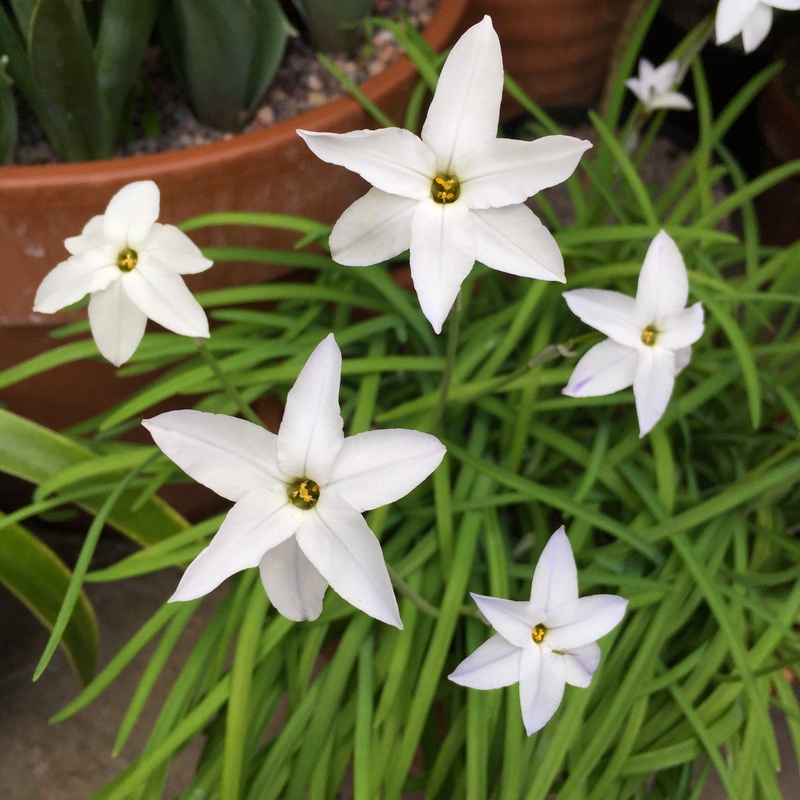 Unlike agapanthus and nerines, ipheion hale from Argentina and Uruguay, which, as far as I am aware, have no similarities to East Kent, climatic or otherwise. However, ipheion like it here and I am always happy to see them in spring. When trodden on, or run over by the wheelbarrow, the leaves emit a very strong garlic scent. I have three varieties, light-blue I. ‘Froyle Mill’, I. ‘White Star’ and another that was creeping along the pathway when I bought the house. Its flowers are also light blue. I have dusky-pink I. ‘Charotte Bishop’ on my shopping list for later this year. 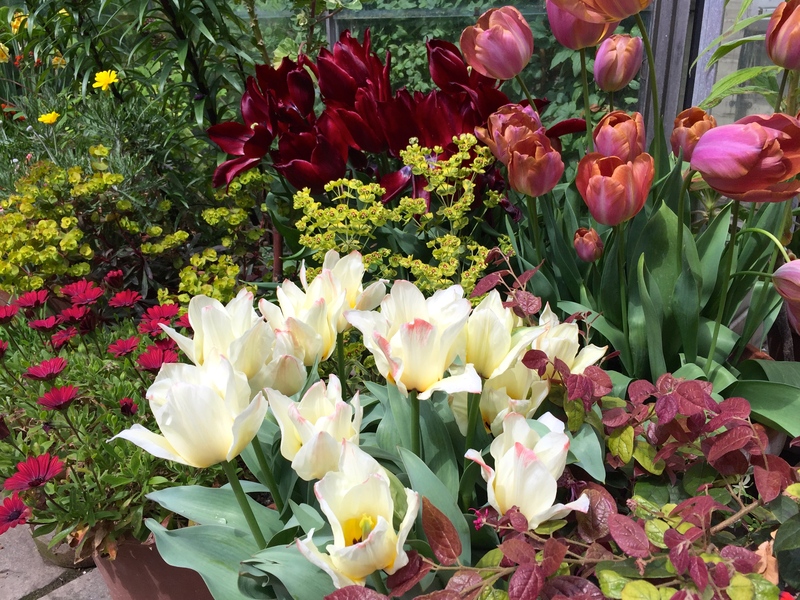 Having evicted only a handful of tulips so far this year, I will need to begin wholesale clearance next weekend in order to make way for my summer display. The greenhouse is exploding. Inside, Cestrum ‘Newellii’ and Echium candicans are begging to be moved outside and I would like the space for other things. I am even toying with tomatoes, although watering them might be a challenge. With another cool week in prospect there is really no hurry to wave goodbye to spring. My grandfather would not have planted out half-hardy plants until the last week of May or the first week of June. Those boundaries can be challenged in these days of global warming, but anyone who waits a couple of weeks will find their plants catch up in no time. TFG. 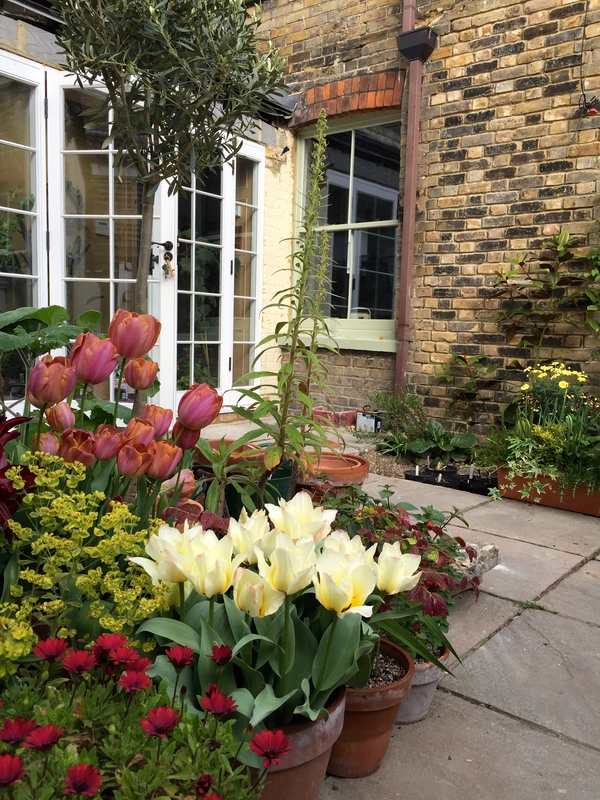 Lovely tulips….all of mine have gone over now. Its been v v dry in Wiltshire and my garden is very sheltered so my lupins are about to flower….very early I think! I will probably lift my tulip bulbs next week and store them. I put all my vegetables in from the greenhouse at the weekend just in time for all this lovely rain! Happy gardening. 🙂 and good luck with your new garden! How exciting! I’m so interested to hear how late you plant your tulips. Can I really wait till February? Is that in pots and do you feed or water them? Lovely post by the way. I’d generally advocate planting tulips in late autumn / early winter, as soon as the weather turns cold. I didn’t manage to take my own advice this year, and planted the majority on 22 January. These have all flowered perfectly well, although probably slightly later than normal. Planting later than this is better than not planting at all provided the bulbs are healthy. If they are in any way shrivelled or mouldy them they need to go in the bin. I plant in pots and water them if it’s dry, especially once the shoots appear in spring and the bulbs are clearly growing. Yes, if nothing else they are bright and cheery. Can’t be tasteful all the time! 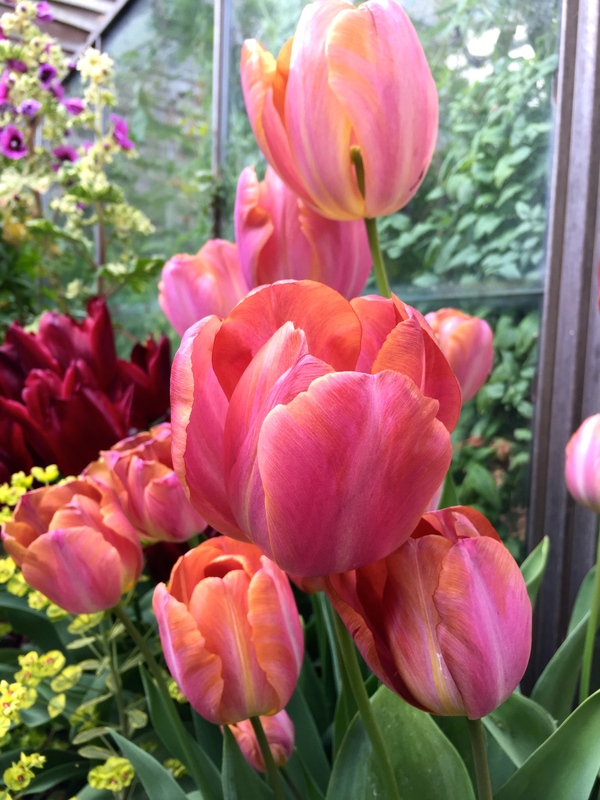 Love tulips so much… Mine are finished here in Somerset with just sad little knobbles where the petals used to be. Must snap them off just in case they feel like coming back again next year. Thank you for the beautiful pics!